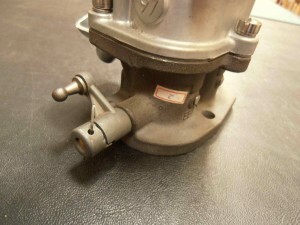 A few guys have emailed us asking about Stromberg 97 hand throttle parts and how to install them. We don’t supply the hand throttle parts on new Genuine Stromberg 97 carburetors simply because most of the carbs we supply go onto hot rods and the hand throttle is not required. Some guys use the parts off their own 97 when they update to a new model, of course, but if you don’t have the parts try Max Musgrove at 97 Express, who recons a lot of 97s and often has spare hand throttle kits. Email him at madmax1946@comcast.net . If you have parts, here’s how to fit them. 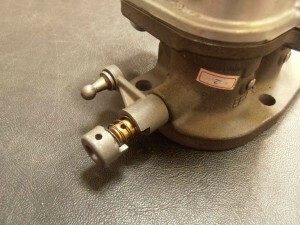 The Stromberg hand throttle parts came on the 97, 48, 40, 81 and LZ models. There’s the main lever with the ball on the end, a small collar, a spring and a cotter pin. Note that at the bottom end of the main lever, on the outside edge, half of the circle is missing (you can just see it in the pic). This mates with the tab on the inside edge of the small collar piece. The tab is smaller than the ‘half of the circle’ that is missing on the lever for a reason. To install it, you push the lever onto the throttle shaft (obviously the other end to the foot pedal throttle bracket). Make sure that the ball is pointing outwards. It should slide right over the throttle shaft bush. If you have a brand new 97, we paint that bush. So you may need to scratch the paint off first. Make sure the lever spins freely on the bush. Then push the spring over the end of the throttle shaft. It goes inside the lever a little at the bottom. Update – 16 Sept 2015. Max Musgrove sent us some pics of the clever jig they built to support the 97 throttle shaft to fit the hand throttle parts. Thought we’d share them with you. Our buddy Lez dug into his legendary vintage magazine stash for this great Street Rodder magazine tech article all about choosing the best air filters for your Stromberg 97s. Written by the highly esteemed Ron Ceridono back in 1998, with input from Stromberg expert Jere Jobe (from Vintage Carburetion North), it is, of course, just as relevant today as then. Sorry about the quality. It’s a scan of a photocopy, but if you click on the pages below, they will come up at a readable size. We have a new project, here at Stromberg HQ! One of those evening ebay moments when the idea starts to allure you with a louder siren call with every click of the mouse, and each picture reveals a little more about the car of your future dreams. Or maybe I was just a little the worse for wear on a Friday night. Whatever, one click to Buy it Now! and I’d bought it then. No time for regrets. Let’s just get her home and get ‘er done. 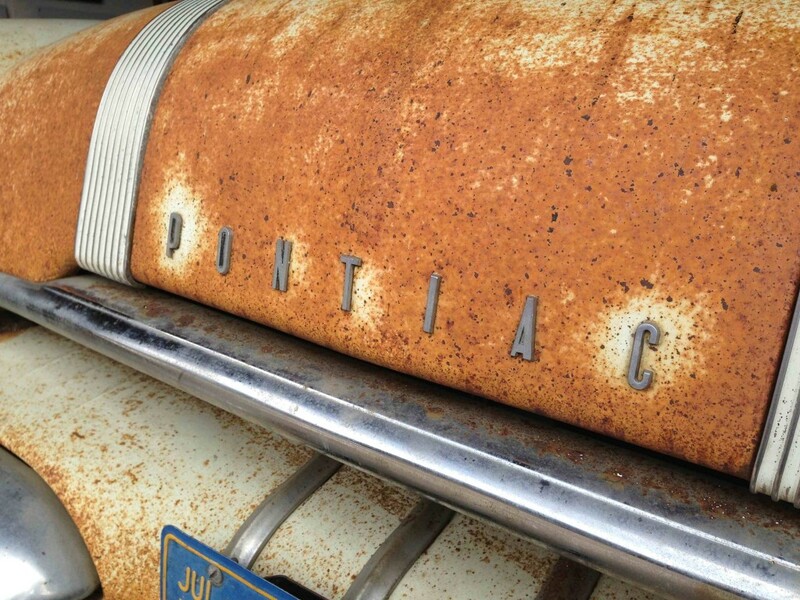 Our very own 1955 Pontiac Chieftain Wagon – 4-door, of course. Been in a barn since 1976 (still had the tags on the Oregon plates). Great original interior. Buick Wildcat chrome rims! No rot whatever. Dirty as heck and in need of a serious ‘going over’. Of course, the ‘getting her home’ part is easier said than done when you live in the East of England, and the car’s in North West USA. No worries, though. One call to our friends at Rinkens Shipping sorted that one out. And another call to our other buddies at Coker Tire had the 215/75 R 15 wide white radials meeting up at Rinken’s Long Beach yard before an overland train ride to Houston TX, then overseas to Felixtowe port, just down the road from us here. Road, rail and sea. The perfect journey. The plan? No body restoration, just a serious detail job, leaving the old patina-ridden paintwork, the scratchy, whacked-up bumpers and the original (though worryingly sticky) interior pretty much alone. Can we repaint anything? No. Can we take bits off to make it easier to clean underneath them? No. Can we tighten the pitman arm which was about to fall off? Err…yes. Can we fit some cool Stromberg 97 carburetion to show everyone how great these 50’s boats can be with multiple 97s? Er…double yes. Lower the front end? You bet. You get the picture. Sooo, so far, we’ve (and I am using ‘we’ in a business sense here – our man Rick’s doing anything vaguely difficult) flushed out the gas tank and cleaned all the lines. Got the motor running smoothly. Drained and refilled the ancient Hydramatic so it shifts when it should. Been through the brakes, rebuilding all the cylinders and replacing anything else dodgy so it stops. Fixed the old carb. Fitted new stabilizer bushes, idler arm assembly, battery, wheel bearings and seals, and radiator hoses. Built a whole new exhaust system. Got the blower fan working..and the lights and a few other small electrical mishaps. And had the radiator and firewall demister matrix recored. OK, we had steam coming out of the demister vents and it looked like a rat had lived in the housing. We’ve registered it and got new UK plates, too. Next? Right now, next is driving it. And more cleaning. The wheels have come up awesome with super-fine wire wool, As did all the chrome and stainless steel. Two of the Wildcat rims have patches of rust in a small rib where the water (condensation?) sat over the years, but I’ve treated it and waxed them to stop it getting worse. The paint is coming up with endless hours of 3M Scotchbrite action with a touch of washing up liquid and eight sore fingers. On the interior, I set my eldest son up with a bucket and brush, and he’s barely spoken to me since. So much for ‘passing the torch’…he didn’t even want the brush! The youth of today, eh?